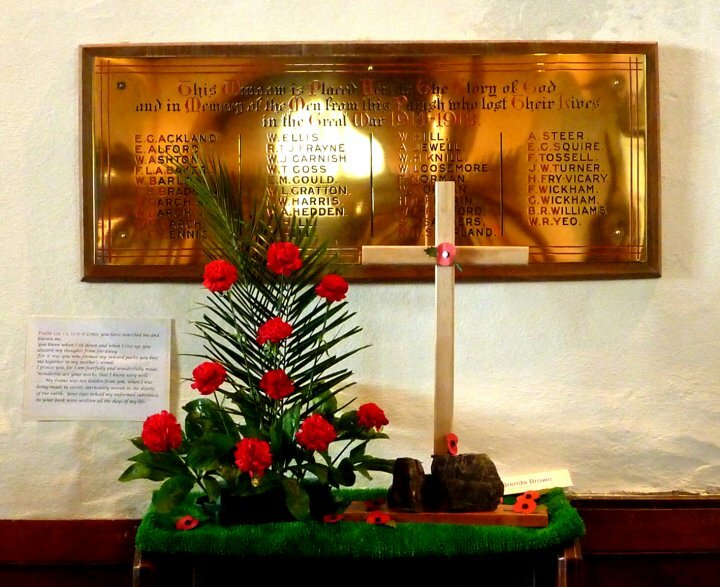 This plaque names the thirty-nine men of Pilton Parish who fought and lost their lives in the Great War 1914-18 and are commemorated below the West Window of St Mary’s Church. The simple but effective flower arrangement was created by Brenda Brown for the Flower Festival at Pilton Green Man Festival in July 2010. The surnames of the men who died were Ackland, Alford, Ashton, Barlow, Braddon, Darch, Dennis, Ellis, Frayne, Goss, Gould, Gratton, Harris, Heddon, Hill, Jewell, Knill, Loosemore, Norman, Perrin, Radford, Sanders, Shapland, Steer, Squire, Turner, Fry-Vicary, Wickham, Williams and Yeo.